This study aims to develop magnetic resonance imaging methods to investigate lymph nodes in the abdomen and how the lymph nodes change with different diseases. Lymph nodes are small, bean shaped structures inside our body and are part of our immune system. The lymph nodes can often swell as part of the body’s response to a range of inflammatory conditions and this study aims to image them using magnetic resonance imaging or MRI, a common and safe medical imaging technique. The images we collect in this study will help us to design better MRI imaging methods to monitor in the future lymph nodes in patients and to follow up response to therapies. We are interested in collecting data from approximately 60 patients diagnosed with one of the following conditions: chronic viral Hepatitis B or C infection, symptomatic Coeliac disease, symptomatic Crohn’s disease, Diverticulitis, active Helicobacter pylori infection or liver cirrhosis. We ask the participants in this study to have just one short MRI scan. For the coeliac patients this needs to be before, or within four weeks, of starting the standard gluten-free diet as the diet may reduce the lymph node swelling and it may be difficult for us to image them. To develop new non-invasive magnetic resonance imaging methods to monitor lymph nodes in patients with inflammatory gastrointestinal diseases. Any data used will be anonymised and you will not be identifiable. Lymph nodes form part of the immune system providing a site for immune cells to attack foreign bodies that have entered the body. This is why nodes often become enlarged during illness. Imaging lymph nodes can be difficult as they are very small. Inflammatory diseases are likely to cause enlargement of the abdominal lymph nodes near the site of disease. We hope the enlarged lymph node data we get from this study will provide us with more information on scanning lymph nodes, which we may be able to use to optimise MRI scanning in future studies. 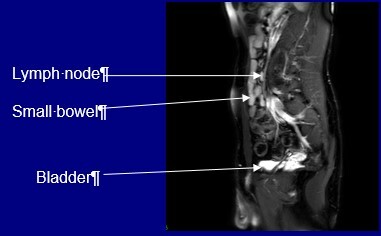 Collecting data on enlarged lymph nodes may also allow techniques used to image lymph nodes to be improved and in the future this may provide more information on where the active disease is located. We are interested in collecting data from approximately 60 patients diagnosed with one of the following: chronic viral Hepatitis B or C infection, symptomatic Coeliac disease, symptomatic Crohn’s disease, Diverticulitis, active Helicobacter pylori infection or liver cirrhosis. We are trying to learn more about the lymph nodes in a range of different inflammatory diseases. The diseases we are interested in are chronic viral Hepatitis, Crohn’s disease, Coeliac disease, Diverticulitis, Helicobacter pylori and Liver cirrhosis. You have been invited because you have been diagnosed with one of these diseases. We will study 10 patients from each of the disease types. If you are interested in taking part in the study we will give you a longer version of this information sheet to read.